(NASCAR)—Martin Truex Jr., wasted little time underlining why he’s the favorite to win NASCAR’s biggest championship with a dominating win in the first playoff race. Truex overcame some early problems to dominate the latter stages of the race, finishing more than seven seconds ahead of Chase Elliott—and pulling away. Joplin driver Jamie McMurray, who started nineteenth in the forty-car lineup, spun while the field was under caution at the end of the second stage, avoided damage and managed to pit for new tires and fuel without losing a lap. He finished tenth, his thirteenth top-ten in twenty-seven races this year. McMurray started the ten-race championship playoffs as the lowest-seeded driver. His top-ten finish and numerous problems for other drivers has put him eleventh in the playoff points. If he holds or improves on that position in the next two races he will advance to the second round for the first time. But his points cushion is small—only five points. Next up: New Hampshire, next weekend. (INDYCAR)—Josef Newgarden could not catch defending IndyCar champion Simon Pagenaud in the final race of the year but Pagenaud could not catch Newgarden in the final points standings. Pagenaud won the race. Newgarden, who finished 1.1 seconds behind him, won the season championship. The two drivers each led forty-one laps of the 65-lap race. Conor Daly led the other three. Newgarden went into the race with a three-point lead on Scott Dixon but Dixon could do no better than fourth behind Pagenaud, Newgarden, and Will Power. Helio Castroneves was fourth. Dixon was the only non-Penske driver in the top five. Newgarden, a Nashville, Tennessee native, picked up his first IndyCar championship in his first year with Penske. Newgarden, 27, is in his sixth year as a fulltime IndyCar driver. He won four races this year, increasing his career total to seven. Fernando Alonso, the former F1 champion who caused a lot of excitement at this year’s Indianapolis 500, appears unlikely to make a return appearance in 2018. His McLaren team has decided to drop the use of Honda engines and is switching to Renault for next year. Michael Andretti, who provided the car Alonso drove in the 500, says the engine switch means Alonso is not likely to run at Indy, where engines from Honda and Chevrolet are used. It is considered unlikely that Alonso would leave Formula 1 to race in IndyCar. 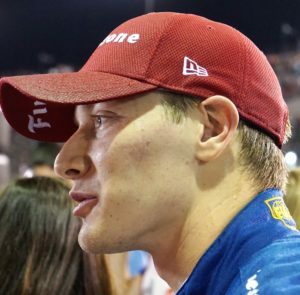 Andretti has signed Zach Veach to be his fourth driver next year. (Formula 1)—Sebastian Vettel’s hopes for a Formula 1 championship might have evaporated in the watery spray of a first-turn crash at the start of the Singapore Grand Prix. It was the first night Grand Prix ever run in wet conditions. Rain had moved onto the circuit shortly before the start. Vettel, considered a favorite to win, started from P-1, in this case on the outside of the front row and jumped to a slight lead as Max Verstappen lagged slightly behind. Ferrari teammate Kimi Raikkonen went for an opening on the inside, found himself pinched against the wall and moved to the right, collecting Verstappen, who hit Vettel’s car. Raikkonen and Verstappen slid into Fernando Alonso, who had shot a gap into third going into the opening left-hander. Although Vettle kept the lead through the turn, his car was damaged and went out of control and into a wall, giving the lead to Lewis Hamilton. Hamilton never gave up the lead he inherited and went on to his sixtieth F1 victory, increasing his points lead over Vettel to 28. He finished 4.5 seconds ahead of Daniel Ricciardo and almost nine seconds ahead of teammate Valtteri Bottas. Formula 1 has only six races left on its schedule including the Grand Prix of Malaysia in two weeks.